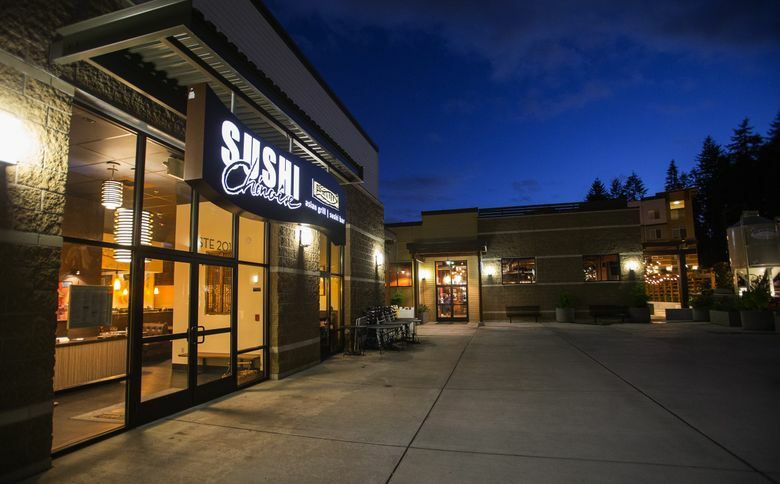 From the owner of Chinoise Café, this new Bothell restaurant has a huge menu of Japanese, Chinese, Thai and Korean dishes. On a Friday night, Sushi Chinoise in Bothell was so busy our party of two felt fortunate to be seated right away, even though our table was way in the back, next to a service bar enclosed by a low wall on which several trays were stacked perilously close to our heads. It is the only poorly situated table in the place; such is the luck of the anonymous restaurant critic. We weren’t neglected back there. Our server, a cheerful woman who flitted about like a butterfly, doted equally on all her customers like a fond auntie. Her name is Ginger. I later learned she started working for proprietor Thoa Nguyen at the original Chinoise Café on Queen Anne, shortly after it opened 20 years ago. Nguyen counts herself lucky that many of her employees have been with her since those early days. After launching three Chinoise Cafes in Seattle, the prolific restaurateur opened The Islander near Pike Place Market, which eventually became Thoa’s, a restaurant and lounge devoted to the food of her native Vietnam. Wabi-Sabi Sushi Bar & Restaurant in Columbia City is Nguyen’s only remaining Seattle restaurant. 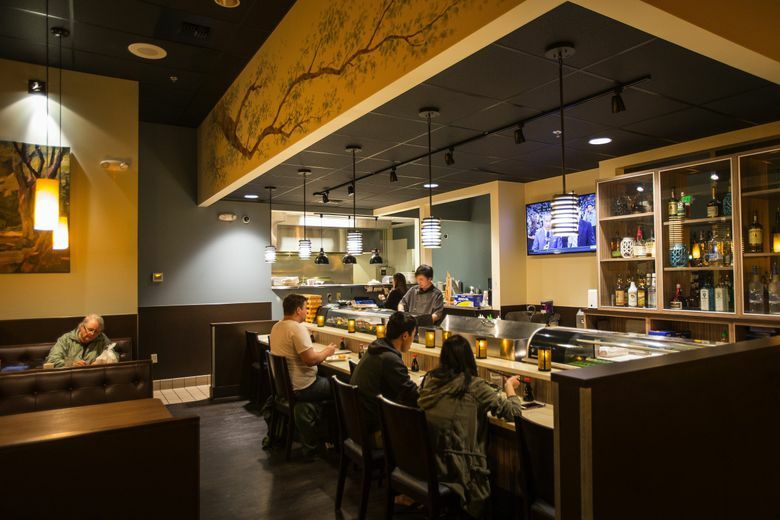 Three years ago, the Mercer Island resident brought the Chinoise concept east, opening a Chinoise Café in the Issaquah Highlands and, this spring, Sushi Chinoise in the Village at Beardslee Crossing. The interior of this pretty pan-Asian restaurant is animated with pastel murals and windows all around. The sushi bar is central to the layout. 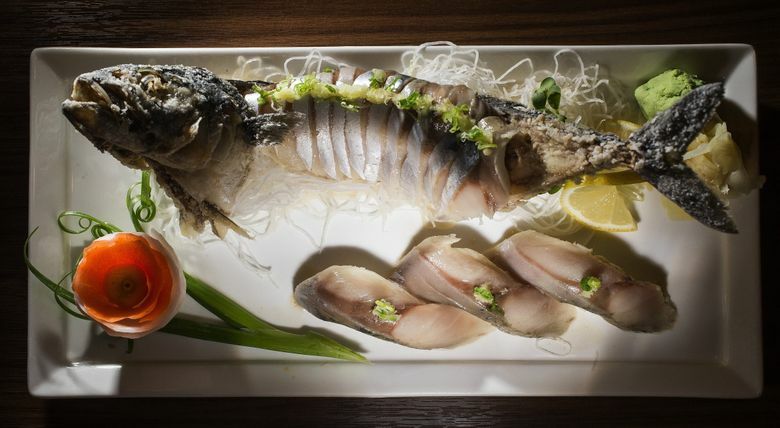 One night, sushi chef Kenny Ma (who also worked years ago for Nguyen on Queen Anne) sliced up silver-skinned Spanish mackerel for nigiri and added a delicious bonus: He included the tempura-fried skeleton of the small fish diving headfirst into a bundle of daikon. Sushi is a reliable way to go here. The rice is stickier than it should be and sashimi is cut thicker than I prefer, but the fish is extremely fresh. You also get a lot of it for the price. Nigiri are so supersized the fish drapes over the rice like a tablecloth with lots of overhang. Don’t even try to eat these in one bite. Maki are so enormous people often make a meal of one or two. The Tropical Roll was tightly constructed with avocado, cucumber and cilantro in the center and, on top, a mosaic of mango and tuna finished with a scribble of spicy mayo. A well-made Spider Roll had the requisite crunch of fried soft-shell crab. The Beardslee roll is made with soy paper, rather than nori. Nguyen says they have kept soy paper behind the bar for years, using it on request. Then they put a soy paper roll on the menu in Issaquah, and it became quite popular. Soy paper doesn’t have the same snap or flavor as nori, but it works well as a wrapper for the salmon, shrimp and snow crab salad that comprise the Beardslee roll, which strikes me as the maki version of a tea sandwich. It could be a metaphor for the restaurant itself. Salads and Vietnamese specialties were among my favorite dishes. The fresh sheet (attached to a wooden board separate from the lengthy regular menu) showcases the beautiful bibimbap that led Nguyen to triumph on “Beat Bobby Flay.” Rather than the traditional beef, she tops her version of this warm-rice salad with ahi poke, adding kimchi-style daikon, seaweed salad, frizzled shallots and strips of sweet omelet. For those who want to kick up the heat further, the chili-stoked Korean condiment gochujang comes on the side. Nuoc mam, the sweet-salty-spicy Vietnamese sauce, accompanies an exhilarating rice noodle salad. Top it with the protein of your choice; mine was tender lemon grass chicken, a pleasing complement to the salad’s other components: fresh herbs, crunchy vegetables and fried, pork-filled spring roll. Rice-paper wrapped salad rolls with shrimp were similarly fresh, vibrant and appealing. Lots of plump, sweet shrimp populated fluffy fried rice, but the General Tso’s chicken here isn’t likely to replace your favorite Chinese takeout version. The sauce hits the right flavor notes but lacks chili punch, and the meat was chewy and gnarly. Wok-fried beef with basil and green beans was as ho-hum as steam table fare from Panda Express. Shanghai noodles stir-fried with beef and vegetables in a garlic, sesame and soy sauce were vastly better. Agedashi tofu, though delicately fried, sat in a dull dashi broth. The most brazenly seasoned dish I sampled was salt-and-pepper squid, another fresh sheet item, exploding with five-spice, chilies and scallion.